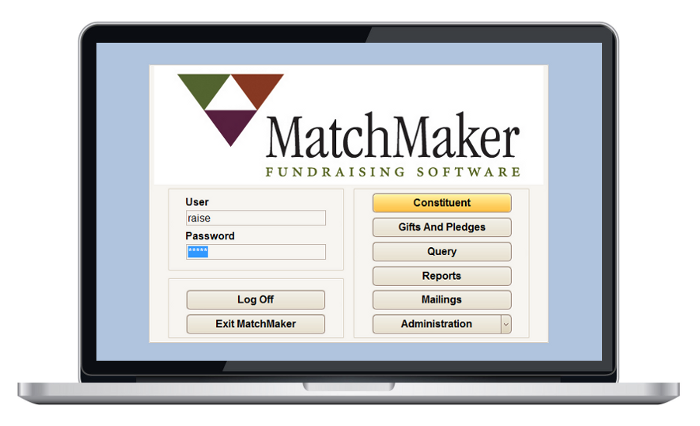 MatchMaker FundRaising Software is uniquely designed for small to medium size organizations. Supplying all the tools to manage a comprehensive fundraising program, MatchMaker frees up more time for you to cultivate donor relationships and maximize your fundraising efforts. This full featured donor management software application enables the nonprofit organization to track all gift types, including annual gifts, memorial contributions, corporate matching gifts, online gifts and pledges. A significant aspect of MatchMaker FundRaising Software is the ability to maintain a vast array of user defined values that are assigned to sources, attributes, gift and pledge transactions, tributes, relationships, memberships, volunteers, and event management. These values are written in English so you do not have to memorize cryptic codes. All values are available for queries and reports. Sign up for a guided webinar today! Manage individuals, corporations, foundations, civic organizations, and more entities that support your organization’s mission. Process and manage gifts, pledges, pledge payments, in-kind gifts, events, membership and online transactions with ease. Manage all aspects of a fundraising program including; donor cultivation, grant tracking, campaign management and more. MatchMaker FundRaising Software’s event management feature is designed to help you manage all aspects of an event. MatchMaker FundRaising Software’s volunteer tracking section is designed to track all activities and interests of your volunteer corps. Maintain and manage your benefit or supporting membership program and accurately track all membership categories and benefits. From the simple to the complex, the data you have so carefully secured, entered, and maintained can be quickly made available. Assign workflow procedures that MatchMaker will carry out automatically when certain predefined conditions are met.